I was a really good eater when I was a kid. Broccoli, tomatoes, mushrooms. Bring it on. But then there were brussel sprouts. I was so confused how something so cute, that was obviously made as cabbages for dolls, had such a foul smell. When I actually tasted one, the mushy texture caught me by surprise in a negative way. As with most jarring food memories, we usually discover alternative ways of cooking dishes to our liking and actually become a fan. Or, maybe it's tasting the difference between something fresh instead of in a plastic bag from the freezer aisle, covered in what could be butter. Who knows. I know now that the sprouts of my past were just overcooked. In walked the "pan fried dumpling method" to save the day. Really, there are a huge amount of possibilities when it comes to the ingredients that can be cooked this way: sear for browning, create steam with liquid, turn to low heat to cook through. All mushiness avoided. 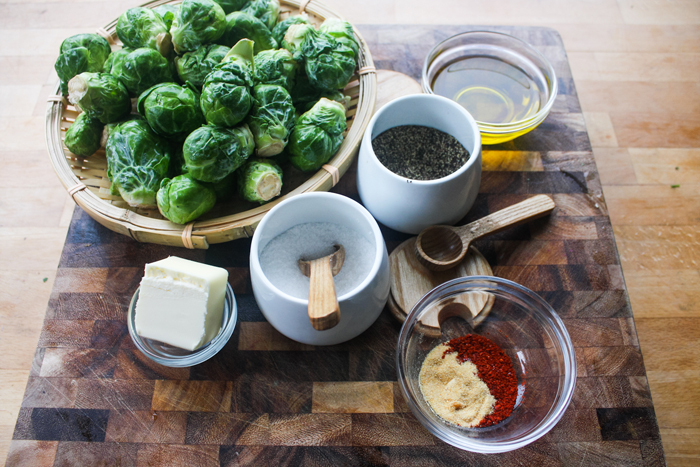 Cut the woody ends off of the brussel sprouts, then cut in halve. Add to a large bowl. 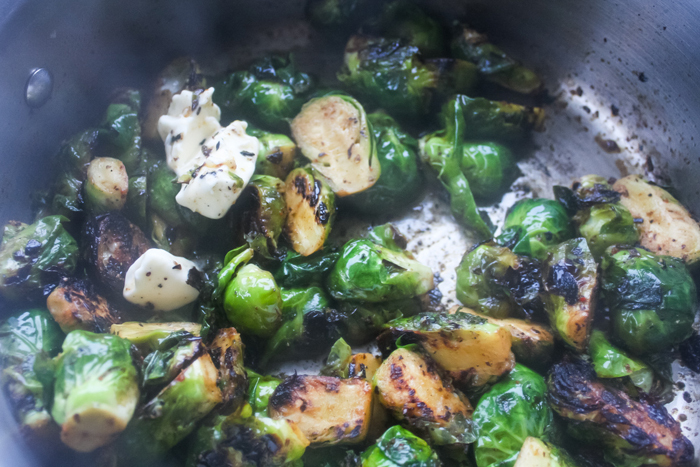 Coat the sprouts with the olive oil, garlic powder, gochugaru, salt and pepper. Toss until evenly incorporated. 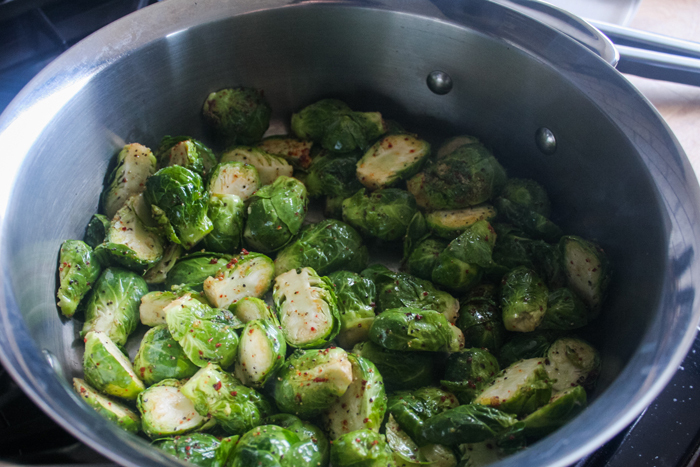 Get the pan hot on high heat, then add the sprouts leaving them unmoved for about 3-5 minutes. Stir, trying to get as many cut sides down and brown for an additional 3-5 minutes. Turn the heat to low and carefully add about ¼ cup of lukewarm water to the pan. There will be a lot of steam and sizzling. 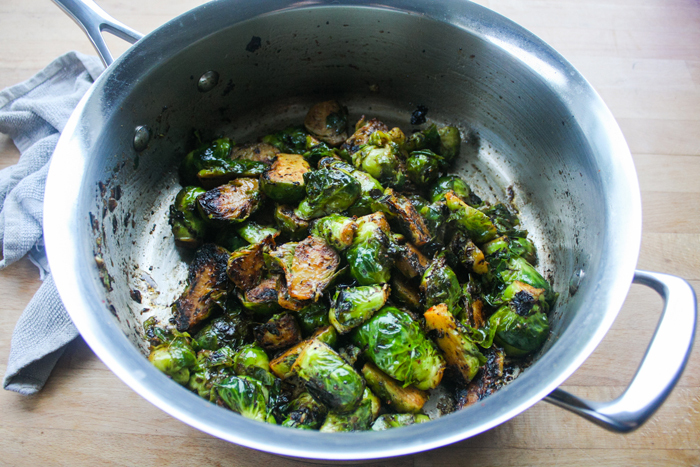 Immediately cover with a lid and cook for about 10-15 minutes, until the liquid has evaporated and the brussel sprouts are tender. Remove from the heat and burner, then add the butter to start melting. Toss until all of the butter is melted and the brussel sprouts are coated. Serve warm.